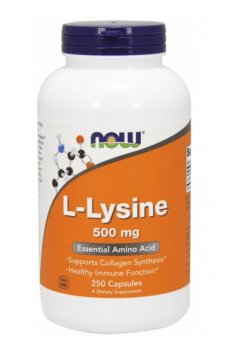 L-lysine in combination with L-arginine more effectively relieves mental stress and anxiety. The typical therapeutic dose of L-lysine used in herpes simplex infections (HSV) is a minimum of 1 g three times a day for 6 months. Supplementation of such a dose can be treated as a regular part of the diet preventing the recurrence of herpes or used as a loading dose for diminishing of the first signs of virus re-activation.